Why Floyd Won't Fight Maidana? Why Floyd Won’t Fight Maidana? The swarmer has always been the natural nemesis of the pure boxer. The pure boxer is unable to keep him off due to his lack of punching power and the pressure fighter is able to do what he does best: SWARM. I feel this is the reason why Floyd Mayweather Jr. vs. Marcos Maidana would be an epic battle of huge proportions. 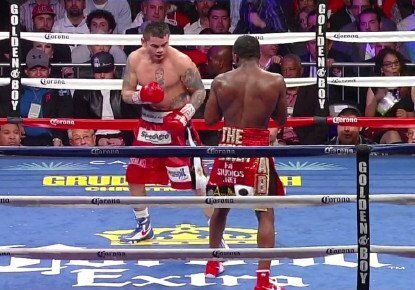 Maidana is coming off a huge winning streak and he really showed a lot of mental toughness and skill by handing Floyd’s Lil Brother Adrien Broner his first loss. This has huge potential as being a big fight. The older brother steps in after the big school yard bully beats up the younger brother. Can the bully beat up the older brother? Lets take a look at history to see what might happen in this fight. Who was the one guy to give Muhammad Ali the toughest fights? Who beat him first? It was a slow moving short armed swarmer named Joe Frazier. Ali had the height, the reach, the speed but Frazier had the toughness and the tenacity. Who’s to say that Maidana won’t be that same nemesis for Mayweather Jr? Rocky Marciano made a whole career out of beating larger, quicker fighters. To the great swarmers this “bigger man” thing isn’t a big deal. Its simply a matter of taking away their advantages and using their innate advantages to their best affect. Can Maidana make history and do what guys like Frazier and Marciano did? Can he overcome his natural disadvantages and make it an advantage like Mike Tyson used to do? What happens when Maidana lands one of those big right hands on Floyd’s chin? Floyd’s chin has never really been tested. For all we know he may have a glass chin. When someone goes to such a great length to not showcase something, it usually means they are trying to cover up a weakness. Is Floyd’s tremendous emphasis on defense a way to mask his weak chin? Don’t forget, my dear reader, both his father and his uncle were plagued by less than stellar chins! Could Marcos Maidana be the guy to finally unmask the great Floyd Mayweather? Never forget this, yes, Marcos Maidana looks slow and easy to hit, but simplicity is the greatest form of sophistication. Perhaps that is what is needed to dethrone this great champion (Floyd Mayweather): Simplicity. A relentless attack based on the idea of landing the right cross over the shoulder roll. It may take Maidana a long time to land it but the drama of the fight unfolding makes this the most interesting fight behind Floyd fight The Pacman! Previous boxing news: Mayweather Sr: Maidana’s too easy to hit for Floyd Jr.
You are here: Home / Boxing News / Why Floyd Won’t Fight Maidana?